So, Russian Parliament just decided that bloggers are in fact mass media. And if you have more than 3 thousands visitors (or friends/followers) per day you have to be registered as a media. Well, not as a “real media”, you don’t need to have a company and everything. But you have to show your name and contact address, verify your sources and abide all laws written for traditional media. Technically that makes each Russian blogger equal to a newspaper and every Russian Youtube personality to a TV station. UPDATE: I see this post got some coverage on Interwebs, so I’ll clarify it a bit. If you’re a blogger and you have 3K daily visitors during one month you have to add required information to your blog so you can be added by government agency to its list of bloggers. You can later opt out if your popularity drops and you’ll have less than 3K viewers per day for three months straight. But when you hit that magic number, you will be registered again. 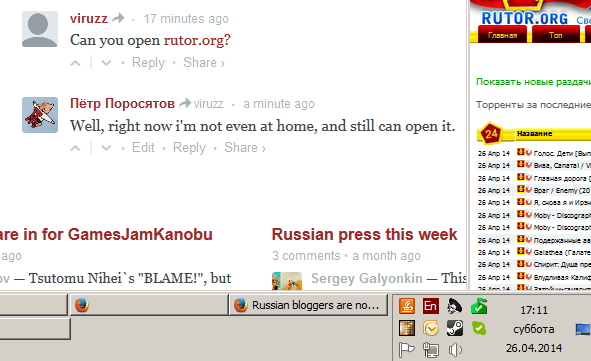 If you fail to comply your blog will be blocked in Russia. Russia has quite an effective system for Internet filtering with deep packet inspection hardware installed at most major providers. So, when Russia blocks you, it blocks you for good majority of its population. No word on international Russian-speaking bloggers. I’m one of those, I have around half a million visitors per month to my personal blog, so I’m kinda worried. Worst case scenario they’ll block people like me as “foreign agents”. My internet provider can’t be regulated by government. It’s not like we have no choice, like in america. So i doubt the part about majority. If you live in Russia then your ISP is already regulated by the Russian government and already filters out web sites, otherwise they wont get a license. Believing in licenses in russia is almost as funny as believing in gods. Well, there is a lot of already banned pages and sites. Yet, i can see them all. At the momen i’m reside in moscow. Well, right now i’m not even at home, and still can open it. Strange, they had banners saying that from date X it will stop working from Russian IP’s and told people how to use VPN, now they have banners to organize people to change the copyright law. Russian internet is not belong to russian government. My earlier comment was deleted. How is this law a bad thing? your post says all you have to do now is verify your sources and follow the media rules, that seems very reasonable. whats the issue? I haven’t delete anything, that’s probably a bug in Disqus. Russia is the issue. No one wants to go to jail. I personally think this law is not about bloggers at all. It is about how to block any given website. In the current wording of the law all websites and online services (without exceptions) must register in the registry and all websites and online services must keep all their logs and user data for last 6 months on the territory of Russian Federation, which is impossible for the majority of websites. If a service doesn’t care about Russian market, it won’t even bother complying with the requirements and therefore will be blocked. And even if it does care, it might not be easy to comply. And only then we have that requirement for all popular sites to register as ‘bloggers’, a pseudo mass media, that doesn’t have any rights, only responsibilities of the official media. ‘Blogger’ is still not a journalist and therefore can’t use any of the journalist privileges to gather and verify information.